Workers of Ceylon Petroleum Corporation, the multi-billion rupee loss-making state liability now under Minister Arjuna Ranatunga, and whose work has a direct impact on the cost of living of Sri Lankans, dealt a body blow to the people – except hybrid drivers – once again with a decision to strike. This came as brent crude, the international benchmark for oil prices, bounced back from just above US$48 per barrel to US$52.52 in just seven days to July 28. If prices continue to recover, it will likely inflate the national imports bill and worsen multi-billion rupee losses at CPC. And then, the physicians also downed tools. Meanwhile, breadwinners of families, students, and businesses felt the full adverse impact of a wild strike that was claimed to be about leasing of 11 oil tanks in Hambantota to the Chinese and a demand to the take back storage tanks leased to Lanka Indian Oil Company Plc in Trincomalee. The Trincomalee deal was agreed in June 2016, not last week. Like in crisis times, long lines of vehicles – everything from motorbikes and three-wheelers to cars, school vans, and buses, formed at filling stations. School transport van operators were enraged. Tempers flared and criticisms were aplenty. Heated arguments arose often at filling stations. There were fights. The police had their hands full. And the army was called out to distribute fuel following a parliamentary decision. The strike would have incurred millions in costs to everyone engaged in economic activity in the country — from salaried office workers to retailers. In the meantime, the Indian operator LIOC, which runs fewer filling stations across the island than the 293 outlets the CPC operates in just the Western Province, was raking in the cash. Bus conductor Sumith Wasantha who operates in a Kuliyapitiya-Colombo run stayed home and his child was also unwell. Because the state doctors were on strike he sought out a private clinic. He lost two days’ wages and can’t recover it in just the two trips he makes a day. Mohamed Rishard a three-wheeler owner in Maligawatte complained of wasting an hour at a filling station. To fill up, he said, he needs to spend Rs 600 and the filling station would not allow him to buy any extra fuel into a container. Mohamed Farook waited more than two hours to refuel his bike. 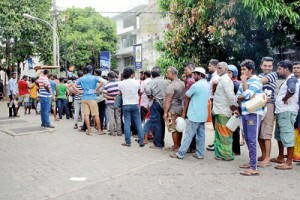 An employee of Lanka IOC at Maligawatte, Rohana Wijesinghe, said staff were advised to work overtime and told not to pump extra fuel into storage vessels. Mr Wijesinghe explained that buses were given priority and allowed a full tank of diesel, but later limited to fuel worth Rs 2,000 to Rs 3,000 per bus. An official of the Foreign Ministry, Prasaad Damitha, was also among many who lined up for fuel at Sir Chittampalam Gardiner Mawatha for the official vehicle. The all Island three wheel drivers association’s president Lalith Dharamasekara, said the group sympathised with the reason for the CPC union action, but disagreed with the method. The president of the Lanka Private Bus Owners Associations’ Trade Union Alliance, Stanley Fernando, said long distance bus services were disrupted. He pleaded that buses be given priority at filling stations. The chairman of the All-Island Inter District School Transport Service Association, N M K Harischandra Padmasiri, said that the strike was an injustice against students sitting for term tests as well as those following Advanced Levels seminars in schools. Some school van operators spent time overnight to fill up, he said. The president of the All Ceylon Government Drivers Union, general secretary, Jayathilaka Pathirana, said vehicles of ministry secretaries were stuck in lines. An ambulance driver at the National Hospital, Prasanna Bandara, said that 18 vehicles had been filled up and were ready. 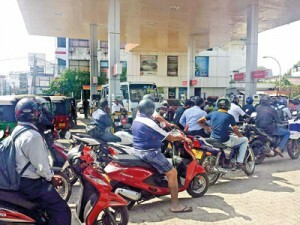 State-owned public liability, the Ceylon Petroleum Corporation, with its army of 2,530 permanent employees, burns up billions in public money and runs 1,226 filling stations compared with 202 operated by the private, Lanka Indian Oil Company, which booked Rs 3 billion profit in 2016-17 financial year on turnover of Rs 81.03 billion. Lanka IOC, which has only 171 staff, including 24 senior management, operates just 40 filling stations in Colombo and 28 in Gampaha in contrast to 293 run by CPC in the entire Western Province. Every employee at Lanka IOC generates Rs 17.9 million profit. Two employees would contribute profit nearly equal to the minister’s ‘personal emoluments’ at the Ministry of Petroleum Resources, headed by Minister Arjuna Ranatunga. Profit at LIOC jumped by 37% from Rs 2.2 billion the year before despite import duties and price controls. A finance ministry adviser sits on its board. A CPC operation, Ceylon Petroleum Storage Terminals, has a 33% percent stake in LIOC. At the Ministry of Petroleum Resources, the minister’s office spending was Rs 88.2 million for 2016 with Rs 36.2 million allocated for “personal emoluments’’. The CPC, the country’s biggest petroleum products importer, posted a massive loss of Rs 4.8 billion in 2015 on revenue of Rs 276.9 billion, even through Lanka IOC data show that petroleum demand grew by more than 103%. Auto fuel sales at LIOC was at an all-time high, with volumes rising by 17.7%. Also, the crude oil price has languished below US$50 a barrel as well for a while. Records show that in June last year, the CPC handed over 84 oil tanks of the Trincomalee upper tank farm to a joint venture with Lanka Indian Oil Company. Prime Minister, Ranil Wickremesinghe agreed. The joint venture was to develop 30 tanks at a time.